Jaka Tarub was a handsome and diligent young man. He lived in a village near a lake. One day, when Jaka Tarub passed the lake, he heard some giggles and laughs of some girls who were bathing in the lake. He was curious, so he peeped through the bushes. There were seven beautiful girls in the lake. They’re fairies from the heavenly kingdom of kahyangan. Jaka Tarub saw a scarf near the bushes. It belonged to one of the fairies. Jaka Tarub then took it and hid it. Crack!!! Accidentally, Jaka Tarub stepped on a twig. “There’s someone!” said one of the fairies. “Let’s get back. Hurry!” she said. They pulled over and wear their scarf. “Where is my scarf?” one of the fairies couldn’t find her scarf. She was the youngest fairy called Nawang Wulan. They tried to search for it, but it was no where to be found. “We’re sorry, Wulan. We have to go back to kahyangan,” said the eldest fairy. “You’ll have to find it by yourself. We’ll wait for you in kahyangan,” she said in empathy. The other fairies then flew to the sky leaving Nawang Wulan behind. Nawang Wulan saw them leaving in tears. She was so sad. “Excuse me …,” said Jaka Tarub, startling Nawang Wulan. “Are you okay?” he asked. 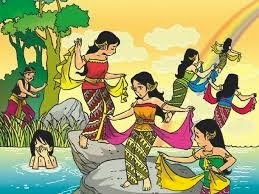 Nawang Wulan moved backward, “Who are you?” she asked. “My name is Jaka Tarub. I was passing by and I heard you crying, so I came to see what happen,” Jaka Tarub lied. Nawang Wulan then told him about her problem. “I can’t fly without my scarf,” she said. Jaka Tarub then asked Nawang Wulan to come home with him. At first, Nawang Wulan refused the offer. But since she didn’t have anywhere else to go, Nawang Wulan then decided to follow Jaka Tarub. Nawang Wulan stayed with Jaka Tarub in the village. A month passed, and they decided to get married. Nawang Wulan was willing to marry a human because she fell in love with Jaka Tarub. After a year, they had a beautiful daughter. They named her Kumalasari. They lived happily. Jaka Tarub was also happy to live with Nawang Wulan and Kumalasari. Especially because he always got a lot of harvest since he married Nawang Wulan. He couldn’t even keep all of his harvest in the barn because it was always full. “It’s so weird. Nawang Wulan cooked everyday, but why is my barn always full,” Jaka Tarub mumbled to himself. He was so curious. One day, Jaka Tarub stayed at home. “I want to stay home today. I’d like to play with Kumalasari,” he said to his wife. “Well, I’ll go to the river to wash the clothes. Please keep an eye on Kumalasari,” asked Nawang Wulan. “I’m cooking rice now. Please do not open the pan cover before it’s done,” she said just before she left. “Could this be the secret?” Jaka Tarub thought. After Nawang Wulan left, he curiously opened the pan cover. He found only one single paddy. “How come?” he wondered. Before lunch, Nawang Wulan came home. She headed to the kitchen to see the rice she had cooked. She found that the rice turned into only a few grains. “Did you open the pan cover?” she asked her husband. “I… I’m sorry. I was curious,” Jaka Tarub said as he realized his fault. Ever since, Nawang Wulan had lost her power. She couldn’t cook rice with only a single paddy. Their paddy supply was slowly lessened. Their barn was almost empty. One day, Nawang Wulan went to the barn to get some paddy. When she took one of them, she found a scarf. “What’s this? This is my scarf,” said Nawang Wulan startled. That night, Nawang Wulan asked her husband about the scarf. Jaka Tarub’s eyes widened, “You found it?” he asked. Jaka Tarub looked down and asked for her forgiveness. “Because I’ve found my scarf, it’s time for me to go back to where I belong,” Nawang Wulan said. Jaka Tarub tried to stop her, but Nawang Wulan had made up her mind. “Please take good care of Kumalasari,” she said. “If she wanted to see me, take seven grains of candlenut and put it into a basket. Shake it as you play the bamboo flute. I’ll come to see her,” she explained.